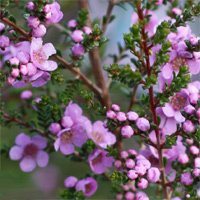 Thryptomene, we first can across thryptomene in the Grampians, what a great winter – spring plant, masses of flowers and very popular in the cut flower industry. With species from Western Australia right across to the East, white to pink flowers and yes it is drought tolerant. Now regarded as a hardy evergreen shrub, Thryptomene is available in a number of species as well as name cultivars suited to larger landscaping projects as well as for general garden use. Some varieties offered are species, some named cultivars and hybrids and a few ‘chance hybrids’ of undetermined parentage. Thrypotomene saxocola fc payne – One of the rock thrypotomones sometimes simply called ‘Paynes Thrypotomene’. Prolific flowering with masses f small pink flowers from winter to spring. Thrypotomene saxocola ‘Pink Lace’ – A named cultivar with flowers that are a deeper pink than most. Thrypotomene calycina – The Grampians Thryptomene, this is a good rounded shrub with pink and white flowers in spring. Thrypotomene denticulata – Lower growing with asprawling nature, reaches arouns .5m in height. Growing from .2m to 1.2m high Thryptomene baeckeacea is a low spreading to prostrate shrub to 2m wide. Flowering from May-October with long lasting a pink, purple or white flowers. With about 40 species of Thryptomene such as Thryptomene micrantha with its tiny white flowers and the darker pink Thryptomene stenophylla, Thryptomene is a good choice as a drought tolerant shrub. Offering a variety of sun hardy Australian natives and exotic trees, shrubs, groundcover's and perennials from semi advanced through to super advanced and semi-mature stock. grow and pictorial lines. Monthly & Annual Forward Order catalogue. Accredited to all States.